Built in the late 1980’s, Boca Sailing and Racquet Club is a gated community, consisting mostly of custom built Mediterranean inspired homes which have been remodeled with wide lake views. The Boca Sailing and Racquet Club offers homes ranging in size from 2,500 to 6,300 feet with between 4 to 6 bedrooms and 2 to 5 bathrooms. One of the unique features of this community is an enormous 45 acre freshwater lake; which is stocked for fishing, and provides a view for more than 60 of the homes. Residents of Boca Sailing and Racquet also use the lake for non-motorized watersports including, kayaking, canoeing, paddle boarding, and of course sailing, There’s even a private boat ramp within the community. The neighborhood hosts its own and several annual events, including a holiday boat parade and chili cook off. Two lighted tennis courts provide residents the opportunity for clinics, private lessons, and league play. A nature preserve with path is a well used jogging and biking trail, with lake views. Located close to Town Center Mall, Sugar Sand Part, and I-95, Boca Sailing and Racquet Club is a suburban enclave, with AMAZING convenience. It also offers boca’s most sought after public schools including Addison Mizner Elementary, Boca Raton Middle, and Boca High. Boca Sailing and Racquet Club is a boutique community, with just over 100 custom built homes. Homes range in price from around $900,000 to $2,000,000, depending on their size, location in the neighborhood, and finishes. 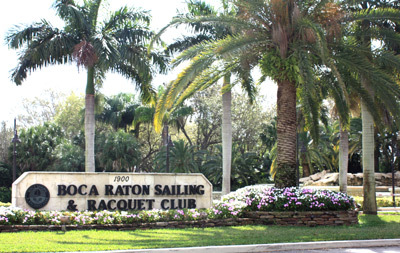 Boca Sailing and Racquet Club is truly Boca living at its finest. And, if you haven't already, be sure to register for a free account so that you can receive email alerts whenever new Boca Sailing and Racquet Club listings come on the market.